Wired Productions’ GRIP: Combat Racing for the Nintendo Switch aims to fill the racing genre void that the Nintendo Switch has suffered throughout 2018. Though unconventional when compared to other racing titles, GRIP: Combat Racing feels like a modern tribute to the 1999 video game, Rollcage – which saw release on the original PlayStation and PC platforms. In honoring Rollcage as a point of inspiration, GRIP succeeds in offering players the ability to drive on walls and ceilings at high-speed in competitive races. However, is the title engaging enough to keep you gripped in for the long-term or will it cut you loose too soon? GRIP: Combat Racing’s unique selling angle is that you can scale walls, drive on ceilings, and navigate your way across treacherous terrain at breakneck speeds without a care. Once you factor in that the races may also have a combat element involved, it sounds like an exhilarating experience that other racers will struggle to match. 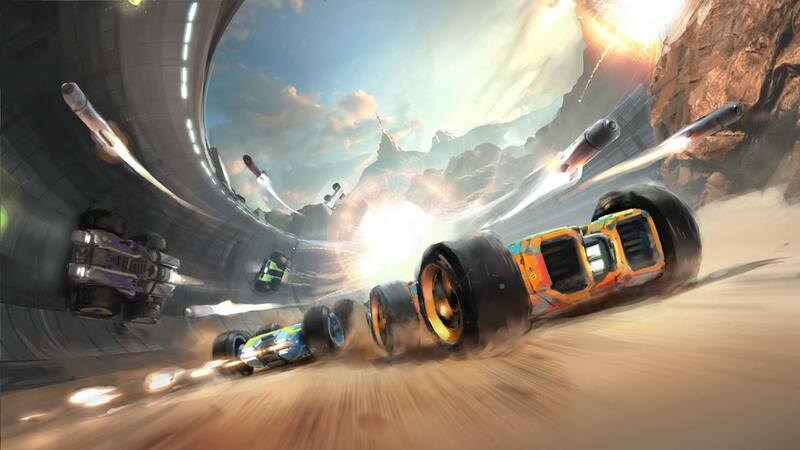 Presenting players with several game mode options, GRIP: Combat Racing is certainly packed with content and variety – especially once you include the Carkour mode. Initially, most will start with the game’s Campaign mode and be eased into learning the finer attributes of racing. Campaign mode is comprised of multi-race tournaments; in which you’ll race against AI opponents, gain experience, and level-up your racing skills. As you rank up, you will unlock vehicle customization options and be able to equip your vehicle with performance enhancers and other boosts. The first couple of tournament tiers primarily consists of traditional racing; however, the game soon introduces combative elements to the mix and this enhances the racing experience quite a bit. GRIP’s campaign mode is more than satisfactory, as it provides enough challenge and gameplay variety to keep you entertained until completion. An evident issue within the Campaign mode is that the opposing AI is never far behind nor ever that far ahead due to rubberbanding. This is both aggravating and a blessing. If you make one mistake late in a race, odds are you will fall a position or two; conversely, if you struggle for most of the race, there is still a good chance you’ll find your way to first place – especially on the lower tier tournaments. The opposing AI can be quite aggressive, but the real enemy you have to be vigilant about is the courses. Select courses have hazards that become apparent in the last second. Eventually, you will learn the course layout and be able to navigate around them without issue, but you may still encounter instances of ejecting from a tube and finding your vehicle pinned against a wall, facing the wrong direction or even flying off the course. Once you are finished with campaign mode or feel like racing in leisure, you’ll find your way to the single-player race mode options, of which include: Classic Race, Ultimate, Elimination, Speed Demon, and Time Trial. Many of these game modes are self-explainable, but a mode worth singling out is Ultimate Race. This particular mode differs from the others as its focus isn’t about being the fastest and crossing the finish line first. Instead, it favors destruction and inflicting damage to the opposition. As you race across the course in Ultimate Race, you’ll acquire various items and will want to destroy your opponents. Doing so will net you points. The more you destroy, the higher your score will be. Ultimate Mode is a nice distraction from the otherwise conventional racing modes offered. Continuing with the path of destruction, there is also Arena mode available to select, which hosts more chaotic game modes like – DeathMatch, Steal the Stash, and The Bomb. DeathMatch is an entertaining mode as you aim to destroy our opponents with a wide array of weapons. Meanwhile, Steal the Stash is similar to a Capture the Flag and Time Bomb tasks you with avoiding the player with a bomb that will self-detonate once time expires. Arena offers a fair amount of diversity in its game mode options and can be quite amusing. The last of the secondary game mode options is Carkour. Carkour challenges the player to precision racing, which has you race over jumps, through loops, and navigate turns to reach the end goal. In concept, this should be an addictive mode that keeps you playing and retrying for a faster time. However, the mode feels frustrating and is more annoying than entertaining, which is a shame because the mode had great potential. Performance wise, GRIP runs admirably on Switch in both handheld and docked mode. Handheld mode is a bit blurry and this can make dodging on-course hazards difficult, but this isn’t an issue when racing in docked mode as the higher resolution and sharper textures make things easier to see.